Babies are a blessing. However, raising them can get very expensive. When a little one moves home, you need all the help you can get. 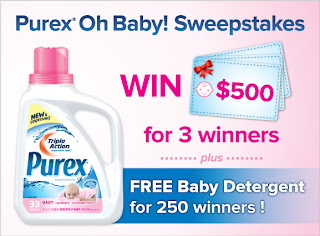 Purex Baby detergent is safe and effective for children's clothing at an everyday value! What a great sweepstakes! Sounds fun and easy to enter. Thanks for sharing. I entered! Entered! how awesome would this be? !